Texas Senator John Cornyn has drafted a sensible, bi partisan supported measure named the Constitutional Concealed Carry Reciprocity Act of 2015. In response, gun hating New York Senator Chuck Schumer has lost touch with reality. To hear Schumer speak of it, Cornyn’s bill would end civilization as he knows it and heralds the oncoming apocalypse. Without notifying the po-lease. Shucks massah Chuck, I dun realize i hadta ask the field massahs if i wanted to use ma rights. Yes. I just used a politically incorrect slave impression to highlight how Chuck Schumer’s mind works. Schumer is so entrenched in his viewpoint that we the people serve HIM and his lifer politician buddies that we need to ask his permission before we are allowed to exercise our rights. He thinks he is the master and we are his servants that need to crawl to him with hat in hand in order to exercise our God given rights. Let me tell you, he is dead wrong. Yet, just like George Wallace standing in the doorway of the University of Alabama, Schumer has vowed to fight against freedom and equality. Awww…it’s a nightmare for law enforcement. Really? Because in your own state of New York nearly the entire upstate Sherriff’s coalition has rejected similar gun control measures by refusing to enforce the SAFE Act. So methinks the Senator is projecting his nightmare onto the police. Richardson is right. 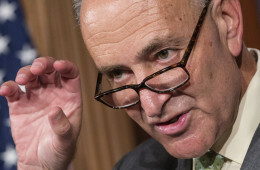 Schumer is incapable of mounting any reasonable or logical response in favor of gun control or against Cornyn’s bill. All Schumer can do is what he has been doing for the past 20 years; fear mongering, whipping up scenarios where blood will run in the street. It’s how he rammed the Brady Bill through in 1993. How he orchestrated the 10 year ban on sporting rifles (though he wanted to make it permanent). How he’s trying to limit magazine sizes on a Federal level. Of course, he fails to even acknowledge that when those gun control measures were rolled back his prognostication of doom never materialized…but I digress. That’s actually pretty brilliant. It hearkens back to thought that you are most vulnerable for defeat at the moment before your victory. For those of you who arm wrestle think of it like this, after a long stalemate you are slowly gaining ground bit by bit and you have your opponent’s arm finally leaning back. Then, all of a sudden, he gives a lot, you are unprepared for this, lose focus and pressure and he overtakes you and slams you down before you realize you’ve lost. The moment those who believe in the 2nd Amendment are conned into believing that the right can be infringed, we have lost the 2nd Amendment. Schumer may be rabid…but even a rabid fox is still a fox. Personally, I can’t wait to visit New York City with my gun on my hip laughing long and loud that the Empire has fallen and freedom rings on the streets of Gotham again. Readers Write: A God-Given Right to Bear Arms? New York is against National Conceal Carry. Question of the Day: How Often Do You Carry?